Vikram to fight with Rajinikanth ? Director Shankar is all set to helm megaphone for the second part of Enthiran series to cast in Rajinikanth in lead role. Vikram's I film was last directorial movie of Shankar which hasn't worked well with story but has crossed 100 Crores at box office. Enthiran 2 pre-production works are said to be kick-started recently and makers are finalising cast and crew of the movie. Buzz is that Chiyaan Vikram to essay negative role opposite to Rajinikanth in Enthiran 2. AR Rehman might scores tunes and DOP by Nirav Shah. Ayngaran International is expected to bankroll this movie. Enthiran 2 might be Rajinikanth's 160th film. 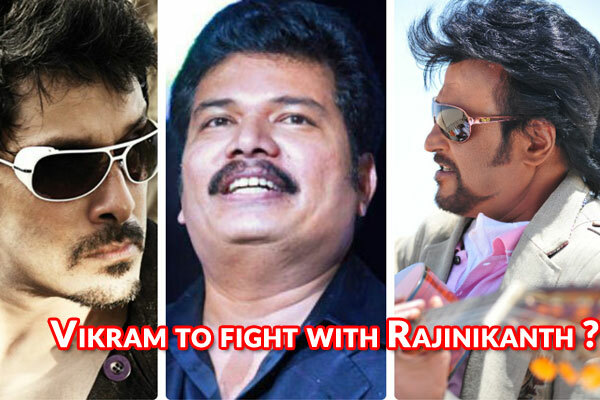 Write & Share about "Vikram to fight with Rajinikanth ? | 2.0 (2 Point O) Tamil Movie News | Cinema Profile" !